Click on the anaglyph stereographic 3D image to launch a Flash player and view the entire photo gallery in 2D or your choice of S3D formats. For the 1939 New York World’s Fair, General Motors collaborated with Rohm & Haas to make a “ghost car”, a 1939 (later updated to 1940 styling) Pontiac Six with a see through body made of the chemical company’s new product, Plexiglas acrylic sheet. Hundreds of thousands of spectators viewed the clear Pontiac at the Fair in 1939 and 1940 and thousands more saw it when it went on a publicity tour to Pontiac dealers across the country. Unlike most cutaways and similar display cars, the “ghost car” is fully operational, though it has only 86 miles on the odometer. Unlike all other transparent cars, this is the first one ever made. When I first found out that RM Auctions was going to be selling this car at their auction in conjunction with the Concours of America at St. Johns, in Plymouth, Michigan, not that far from Cars In Depth world headquarters, I knew that this was one car that I’d be stupid to not shoot in 3D. How many times will you get to take stereo photos of a see-through car? The preview for the auction was today, the sale itself will be tomorrow on June 30th. 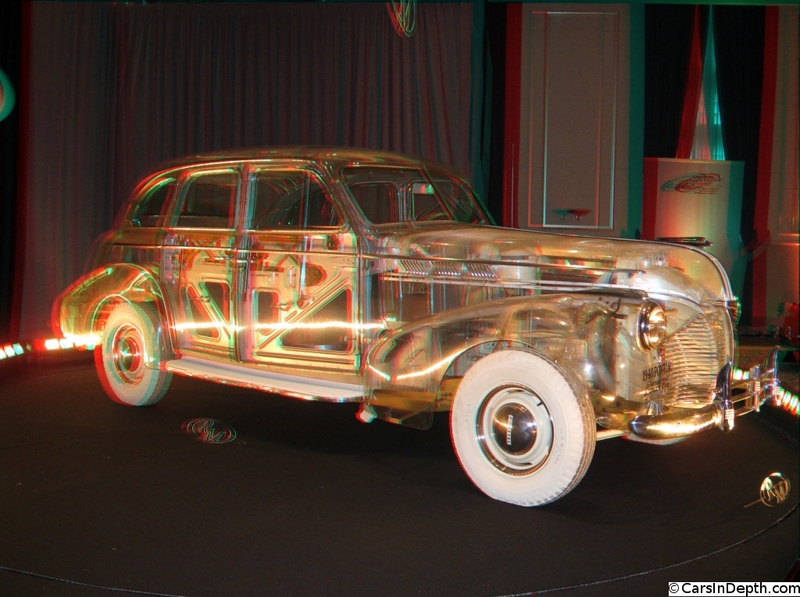 The Pontiac ghost car has been in a private collection for the past 30 years and in all likelihood, these are the first and only stereographic 3D photos ever taken of the car. The car is in remarkable condition when you consider the state of the art of plastics in the 1930. Some of the panels are cracked and the hood is badly crazed with spider cracks, but for the most part the ghost car is intact. I spoke to the consignor, whose family has owned the ghost car for a generation. He had no idea how much it would bring at auction and asked me what I thought. I didn’t have a clue but told him that I was guessing about $400K to $500K. RM’s estimate is $275K-$475K, though some of the registered bidders at the preview felt it is going to be a seven figure car. He’s hoping that no matter how high the price is, that the ghost Pontiac goes to a good home. Actually, he’d prefer it if General Motors bought the car because that way it will be preserved and displayed at the GM Heritage Center. GM, though, doesn’t typically buy the cars that are at the GMHC, so in all likelihood the ghost car will end up in another museum or in a private collection. 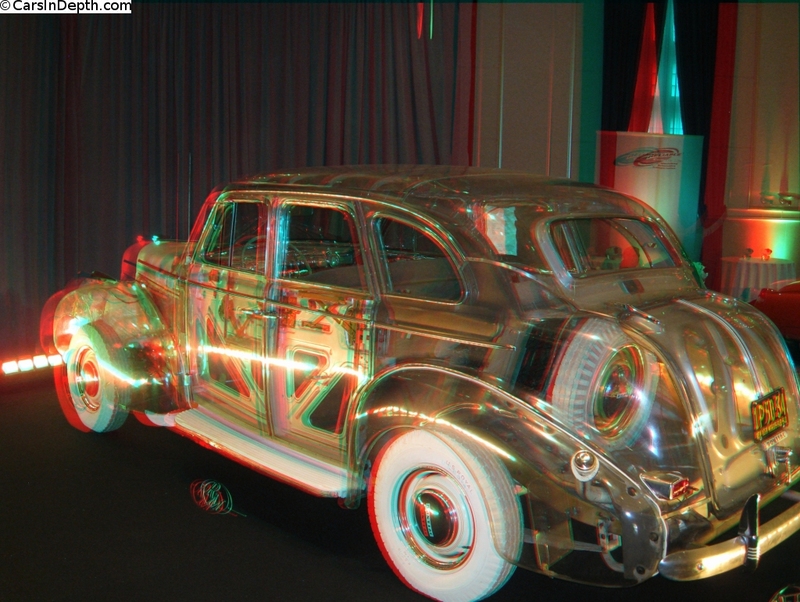 This entry was posted in 3D Imagery, 3D Photos, Auctions, Pontiac and tagged Plexiglas, Pontiac Ghost Car, Rohm & Haas. Bookmark the permalink.